Larry Moran is (justifiably) bemoaning the credulous Canadian media, particularly the Toronto Star, and its reporting on the supposed "discovery" of Noah's Ark (again!). Well, now CTV Toronto has also reported on it, though its report is a bit more skeptical, including in its piece the doubts raised by Dr. Randall Price, an evangelical Christian who was the archeologist for the Chinese-led team in 2008 when it made the alleged discovery, that PZ Myearshertz previously noted. If people believe in the ark. Then you have to believe in God. Maybe they should bring prayer back into school and bibles back in the courts may be our world would be a better. If you take God out and then you wonder why the world is like it is. God is a gentleman. He will not show up where he is not wanted. Hmmm, that would be the same God who showed up with a giant flood that wiped out all the men and women who didn't want him, and even the newborn children who didn't know they were supposed to want him? Actually Noah had seven pairs of the clean animals, four pairs of the dirty animals, and four pairs of birds. 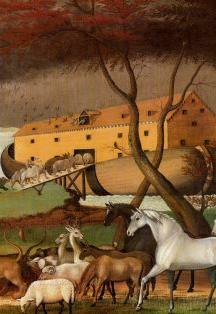 And Noah wasn't stupid, so it is very likely that all the animals were very young. Why bring a 15 foot tall African elephan when you can bring a 3 foot tall African elephant baby? Noah's Ark was also the most clever use of laminate structures that we use in aerospace today. He used gopher wood, which is almost a reed, dried it completely, and sealed it inside and and out with pitch. Today we use a styrofoam with epoxy and glass or carbon fibres. The material use will be an indicator. It is also a very foolish assumption to believe that these guys were cavemen. They had 2000 years to develop, with everyone speaking the same language and having the same culture. Look how far we have come in the last 100 years. These guys had all the science we have today. Ah! That explains how eight people could build a boat that could hold all the world's species of land megafauna (we'll let 'em slide on beetles). Noah had robots and computers and an advanced materials lab! This sounds right to me, the Ark was seen from above in 2004 in the same location or about. ThePBS Channel and the TBN Channels have both reported on this in the past. Not that I personally beleive that evidence is needed to believe this, I do not doubt it at all. God Flooded the Earth, not just a section, read the Bible. Intelligent Design is now accepted, there is no myth here. Of course ... being on television makes it true. And ID, which, of course, has nothing to do with God or religion supports Noah's Ark and a worldwide flood. Mandosa apparantly u dont believe in god. Who cares theres no evidence. God said there was so there was. The "lack of evidence of a catastrophic flood" is easily disputed by the accurate accounting for the flood in the Bible. Carbon dating 4800 year old wood is not easily manipulated. As Christians, we take a lot of things on faith, but the "sight" of the ark confirms a lot to me. Carbon dating is not easily manipulated, unless, naturally, you don't like the results. I find it totally hilarious when all these scientists claim there was no worldwide flood. So were did all the water go, when the glaciers covering most of the northern hemisphere, melted? Modern geology shows there were three successive floods beginning around 11,000 bce, releasing massive amounts of water. The rising water levels broke through the straits of Gibraltar flooding the valley now called the Mediterranean Sea, then later the rising water from Med broke through into the Black Sea. With the melting finally finished, the sea levels had risen around 300 to 400 feet worldwide. If this wasn't a worldwide flood or devastating to anyone living at the time, then what was? It's getting harder and harder to believe in these modern educated scientists, as they deliberately ignore the real scientific data, to advance political agendas. So, three localized floods prove a worldwide flood that lasted for less than a year? And a 300 to 400 foot rise in sea levels deposited the ark "near the peak" of 16,854 foot high Mt. Ararat? And, by the way, just who produced the evidence of the inundations of the Mediterranean and Black seas, other than those "modern educated scientists"? It is amazing how people do not believe. This world that we live in was designed by God. Anything you have was designed by someone. How could anyone look at the beauty of this world and how everything was placed just right so we could inhabit this world. And isn't it amazing how well a puddle fits the hole it's in? Non beleiving scientists assume the world was exactly as it is now 5 000 years ago. If there was that much water on the surface of the earth, and the earth had a single continent, few high mountains, and the pressures of the rain water, caused the "fountains of the great deep" to spring forth, can anyone imagine what this would have caused? An absolute entire change of the earths surface features. Mountains would spring up, Indeed the passage in genesis says when the rains stopped, the land rose, and the seas fell. This alone would explain why less water would be needed than scientists always assume. Apparently this writer can imagine what the flood caused. Too bad he can't explain why mountains would "spring up." Well like I said before and I will say it again. I rather believe in a God in this life and die and after see that there is not one then to live this life not believe in a God and die and see that there is one. Could Pascal's Wager not show up in a thread like this? When you get down to the very basics of things it takes faith. If you say you don't have faith in something your lying. To honestly think there isn't anything bigger than you and this world is ludicrous. As long as I can't understand it, it's not true and laughably so. "Just imagine for a moment what would happen if the powers that be, the governments and the people who dictate rules and life to us actually agreed that it was true. All of it. That the evidence found in archeological sites world wide, etc,etc was supporting the existence of God." Then the entire world would be like Afghanistan... I've been there... trust me... you wouldn't like it. It is interesting how much people will make stuff up in the service of a literal interpretation of the Bible. It's almost like they've made up their minds already and have to come up with an excuse for believing it. Anything you have was designed by someone. I have hemorrhoids--who designed them? To honestly think there isn't anything bigger than you and this world is ludicrous. My house, which is good, because if it wasn't bigger than me I'd be very uncomfortable trying to relax in it. The capacity of religious people to believe truly inane things.